Tom Lynch is an artist that has many how to books on watercolors. His paintings are bright and vibrant and pack a punch. However, he uses many colors that are considered unstable and will fade quickly. His books tend to promote his techniques without sharing too much detail on how to achieve them. Having said that, if you are willing to read closely, there are some important techniques that can be found in them. Recently, Daniel Smith’s had a sale, and included were some Holbein paints that were part of a Tom Lynch palette. Small tubes, but still the four colors were under $4! I couldn’t resist since I was buying some other things as well. The four colors were Holbein Peacock Blue, Permanent Yellow Lemon, Permanent Green Light and Opera. I added Holbein Burnt Sienna, which is another color I know Tom Lynch uses. I think some of these colors may even be obsolete these days, but they’re fun to play with. 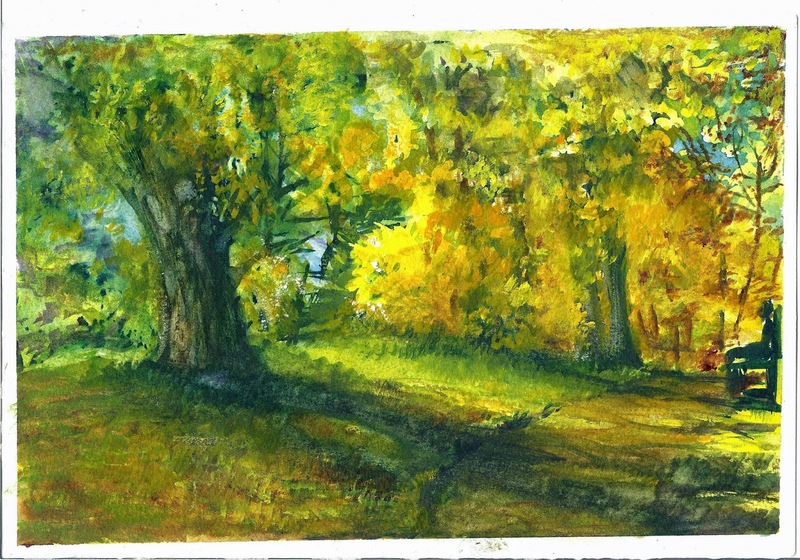 I think I can get the same or similar results using Phthalo Blue, Azo Yellow or Hansa Yellow Lt. I already use Holbein Opera, but might try substituting Quinacridone Magenta or Quinacridone Rose, and I have Permanent Green Light from Daniel Smith. It will be interesting to see how close I can get. Awesome, thank you for making it for me to see!!!! !